The following is a list of non-numbered and numbered (Peel Regional Roads) in Mississauga, Ontario. 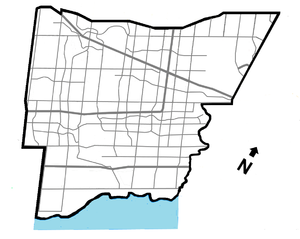 East-west roads in Mississauga were laid out from Dundas Street and (with the exception of Lakeshore Road) divided by Hurontario Street as East or West (e.g. Dundas Street East and Dundas Street West). A part of the former Highway 2, Lakeshore Road is the most southerly major arterial road in Mississauga, and is a continuation of Lake Shore Boulevard in Toronto. Lakeshore jogs 2 km south at Southdown Road in order to remain close to the shoreline, and it continues west into Oakville, before ending in Burlington. Lakeshore is the only arterial road which crosses Hurontario Street but is not divided into east and west segments by it, instead being split by the Credit River. Winston Churchill Blvd. - Southdown Rd. Royal Windsor Drive is the westerly concession road continuation of Lakeshore Road's main (eastern) section. It was the concession road between Concession II SDS (South of Dundas Street) and Concession III SDS, which is the present western section of Lakeshore after it jogs south along Southdown Road. East of Dixie Road, Queensway runs with a hydro corridor in its median. Queensway, often referred to The Queensway after its official name in Toronto (which in turn gets it's name from the city's Queen Street, of which it is a westerly continuation of), is designated as Peel Regional Road 20 east of Mavis Road. Once referred to as the Upper Middle Road between Dundas Street and the Middle Road (now part of the present-day Queen Elizabeth Way). Dundas Street is a section of the former Highway 5, and was a very busy and important historical route running from Toronto to London. Dundas is traditionally considered Mississauga's main east-west street. Bloor Street continues from Toronto and ends at Central Parkway. Formerly had a short, separate western stub running west of Hurontario St, which is part of Central Parkway today. Central Parkway is a road with an unusual course; running south from Burnhamthorpe Road as a continuation of Creditview Road, then turns east along the baseline of Bloor St. west of its terminus, where it turns back north to Eglinton Avenue and becomes Kennedy Road. It was the only completed section of what was intended to be a series of ring roads around the City Centre. Burnhamthorpe Road runs across the city and continues into both Toronto and Oakville, passing through the Mississauga City Centre en route. An unusual aspect of Burnhamthorpe is that, unlike other thoroughfares originating in Toronto, the road is relatively short in that city and its primary section runs through Mississauga. The road is named after the former hamlet at the intersection of Dixie Road, which was in turn named by settler John Abelson after his hometown of Burnham Thorpe, England. Burnamthorpe was formerly a concession road between Concession I NDS and Concession II NDS (North of Dundas). Rathburn Road runs from Creditview Road to east of Fieldgate Drive. Originally intended to be an extension of a separate, older section in Toronto. However, the proposed bridge over the Etobicoke Creek to connect the two sections was never constructed due to opposition by residents. Mavis Rd/Highway 403 - Rathburn Rd. Centre View Drive was constructed in the early 1990s to provide direct access between Highway 403 and the City Centre. It splits off the eastbound Mavis Road offramp and passes under it (westbound traffic uses Mavis itself to access the 403) then ducks beneath Confederation Parkway and runs parallel to the freeway until just west of Hurontario Street, where it turns south, crosses Rathburn Rd., and continues as City Centre Drive. Highway 403 - Eglinton Ave.
Eastgate Parkway was also constructed in the early 1990s, as an arterial extension of the east-west leg of Highway 403 where the freeway sharply turns north to meet Highway 401 near the northern terminus of Cawthra Road. It runs east to Fieldgate Drive, where it curves north to end at Eglinton Avenue. A portion of the Mississauga Transitway runs parallel to the road for its entire length. Eglinton Avenue continues west from Toronto and continues still further west into Milton as Lower Baseline. From Renforth Drive west to the Etobicoke Creek, it forms part of the Mississauga-Toronto city boundary. The Mississauga Transitway runs along the north side of the street along this stretch. Formerly a part of Lower Baseline, which was so named due its role as the divider between two separate concession road surveys, which resulted in it being the original termini of several north-south roads on both sides of it. Matheson Boulevard is a mid-concession road built in modern times and follows a gradual diagonal course. It originally had a separate section through the Airport Corporate Centre it was bridged over the Etobicoke Creek. It ends at Renforth Drive in the east and has a brief 350 metre (0.2 mile) extension into Toronto via an overpass to meet Eglinton Ave. It began a minor road which turned south at Dixie Road, and after being extended, the short north-south section was bypassed, though it was not renamed, and was itself extended south to meet Eglinton. However, this is technically not a name duplication, as the main section of the street has "East" and "West" designations, while the bypassed portion does not. Britannia Road continues east from Milton, and is designated as Peel Regional Road 3 as far as Hurontario St. It then continues to Kennedy Road, where it breaks due to the presence of the Highways 401, 403, and 410 stack interchange. It resumes west of Tomken Road and ends in the cargo terminal area inside Toronto Pearson International Airport. Originally extended to Indian Line (the precursor to modern day Ontario Highway 427) but that section was cut off by the airport, though the easternmost portion still exists and is named Elmbank Drive, after the hamlet the airport displaced. Britannia was formerly a sideroad between lots 5 and 6. Mavis Rd. - Britannia Rd. Courtneypark Drive is a modern, mid-concession road and runs east from Mavis Road and joins with Britannia Rd. in the western infield area of Pearson Airport. Derry was formerly a sideroad between lots 10 and 11. Mississauga's north-south roads were sideroads, running perpendicular to the concession roads, with Hurontario St. as the dividing line. Due to the separate survey grids on either side of Eglinton Ave., few roads run the full north-south distance through the city, except where the two grids line up. Ninth Line (originally Ninth Line East) was originally in Halton Region, and its designation follows the numbering sequence of roads therein: Bronte Steet in Milton being First; Highway 25 Second; and so forth. When Mississauga was incorporated as a city, land was transferred from Halton to Peel. At that time, Ninth Line marked much of the western boundary between Mississauga and Halton Region. Due to an additional annexation west to Highway 407 in 2010, the central section is now entirely within the city, but the road was never redesignated to reflect this. However, the stretch between Dundas St. and the vicinity of the Highways 403 and 407 interchange still serves as the west city limits, and Ninth Line also continues entirely within Halton on both the north and south. Winston Churchill Boulevard is designated Regional Road 19 between Lakeshore Rd. and Dundas St. It was the original western boundary of the city, and the original border between Halton and Peel Regions, until the lands to the west were annexed from Halton to Peel. It still forms the city limits south of Dundas. From Eglinton northwards, it was formerly Sixth Line West. Dundas St. - Derry Rd. Glen Erin Drive is a winding road that was constructed in phases to serve the planned communities of Erin Mills and Meadowvale, with the central connecting portion being completed in 1993. Southdown Road begins where Lakeshore Rd. jogs by continuing it northwards at a 90-degree curve, functioning as the link between Lakeshore's two sections. It has two lanes until just south of the intersection of Royal Windsor Dr. and the eastern leg of Lakeshore, and widens to four lanes until it reaches the Queen Elizabeth Way, where it continues as Erin Mills Parkway. QEW - Turner Valley/Mississauga Rds. Erin Mills Parkway is designated Regional Road 1, and is a very busy six-lane arterial which begins at the Queen Elizabeth Way as a continuation of Southdown Rd. It was named after the Erin Mills community through which it predominantly runs and was built as a realignment of Fifth Line West (which still exists in two sections; the first which still runs for approximately 1 km. (0.6 mi.) on each side of Dundas St., and the second as a part of Vista Drive near Thomas Street) and runs north to the intersection of Mississauga and Turner Valley Roads. Mississauga Road turns in from the east and continues Erin Mills' course northwards. Mississauga Road begins at J.C. Saddington Park by as a north-south road, then angles northwest from near the QEW to south of Dundas St. where it resumes its north-south course. It serves as the main drag of Streetsville where it is called Queen Street and uses Britannia Rd. as an anomalous local north-south divider. Despite its length, it's predominantly a low-capacity two-lane road until Britannia Road, where it widens to four lanes, and expands to a major six-lane artery after it merges with Erin Mills Pkwy (see above) and assumes the Regional Road 1 designation just south of Highway 401. It continues into Brampton and ends in Caledon. From Eglinton northwards, it was formerly Fourth Line West. Burnhamthorpe Rd. - Derry Rd. Creditview Road gets its name due to it running very near or within the Credit River valley, although it only runs through the valley itself within Brampton today. The southern portion between Burnhamthorpe Rd. and Eglinton Ave. was realigned to link with the western leg of Central Parkway. The old portion was renamed, on each side of Highway 403, as Perivale and Rathkeale Roads, with their former status as Creditview being evident by the utility poles which still line them. To the north, the street was also realigned near Derry and Old Derry Roads to bring it outside the Credit River valley and interline it with Meadowvale Boulevard, leaving two bypassed sections: Old Creditview Road and Bellshire Gate. Consequently, the Brampton section of Creditview is now entirely discontinuous from its Mississauga counterpart. Meadowvale Boulevard is a collector road and continuation of Creditview Road from west of Derry Road to just south of Highway 407 where it becomes Heritage Road heading north towards Brampton. Meadowvale Road service mostly a light industrial area of Mississauga. Between Eglinton and Old Derry, Creditview was formerly Third Line West. The former northern terminus of Mavis Rd. at Britannia Rd. in 1991. Mavis Road is a continuation (and formerly part) of Stavebank Road. It originally ended at Eglinton, but was extended to its present length in two phases during the 1990s, bypassing Second Line West, and then merging with it just north of the city limits in Brampton. Mavis continues north of Highway 407 into Brampton and north of Steeles Avenue the road becomes Chinguacousy Road. Confederation Parkway begins as a two-lane road at Queensway, widens to four lanes at Dundas St., and curves northwesterly towards Eglinton Ave. The section through the City Centre is rapidly developing into a condominium tower highrise node. McLaughlin Road is a continuation of Confederation Parkway. When it was reconstructed from a rural to a suburban road in 1989, it was built with only two lanes between Bristol Road and Matheson Boulevard to preserve a maple sugar bush on the western boundary of the historic Britannia Farm property. McLaughlin Road is formerly First Line West. Looking north up Hurontario St. from Dundas St.
Hurontario Street is Mississauga's main street. Runs north from Lakeshore Road (Lake Ontario) and continues all the way to Collingwood on Georgian Bay (Lake Huron), hence the street's name. Formerly part of Highway 10 and still often colloquially labelled as such. The Hurontario LRT, a Light Rail Transit line planned to run along the street, has been approved, with construction expected to begin in 2018. 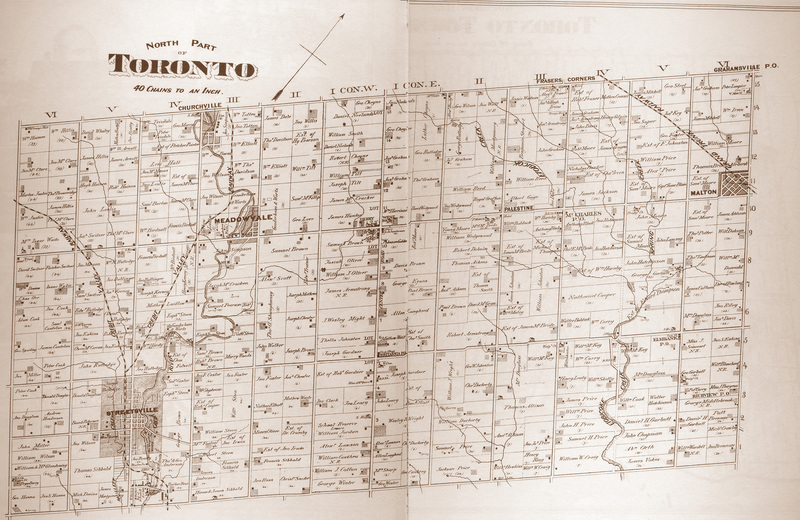 Hurontario was the centre of the land survey, and marks the division between 'East' and 'West'. Kennedy Road runs north from Eglinton Ave. and continues south of it as Central Parkway. It is named after Thomas Laird Kennedy, a former local MPP and the 15th Premier of Ontario. It was formerly First Line East. Cawthra Road is designated as Peel Regional Road 17 and runs from Lakeshore Rd. to Eastgate Pkwy. and then interchanges with Highway 403. Named after the Cawthra family, whose estate, today owned by the City of Mississauga, is still located on the road. A different survey grid was used in southern Peel - thus Cawthra does easily fit into the line road numbering. Tomken Road, like Kennedy Road, is named for Thomas Laird Kennedy, with "Tomken" being a portmanteau: Thomas Kennedy. The portion north of Eglinton Ave. was once called Heart Lake Road (parts of which still exist in Brampton), but was absorbed into Tomken, as a result of both a jog elimination at Eglinton, and of being severed from the Brampton section due to Highway 410 subsuming most of its route in that city. It was formerly Second Line East, and is one of the few concessions roads to pass through both survey grids without fitting into the general pattern of both. Dixie Road is designated as Peel Regional Road 4 (and also, as of 2016, Veterans Memorial Roadway) and is one of city's busiest roads, with very heavy truck traffic in the industrial areas in the vicinity of Highway 401. Dixie forms the western boundary of Pearson Airport for a short distance south of Derry Road, and is the easternmost arterial in the southern half of Mississauga, due to the city's eastern boundary tapering towards the lake. It is named after a former hamlet, which itself was named for Dr. Beaumont Dixie, who lived in Erindale. North of Eglinton, it was formerly Third Line East. South of Eglinton, the survey system was different, and Dixie was the sideroad between lots 5 and 6. Bramalea Road is named after the Bramalea area of Brampton. It was formerly Fourth Line East. Torbram Road's name is a portmanteau of Toronto and Brampton. "Toronto" likely refers to Toronto Township, the precursor municipality to Mississauga, rather than to the city. It was formerly Fifth Line East, which once continued south to present-day Eglinton Avenue, with the southern section being removed with the expansion of Pearson Airport. Airport Road is designated as Peel Regional Road 7 and, as the name suggests, passes by Pearson Airport. Its original southern terminus was at Lower Baseline (present-day Eglinton Ave.) but today swings east to link with Dixon Road in Toronto at Highway 427. Northwards, it runs through the Malton neighbourhood, and continues all the way to the Dufferin/Simcoe County line south of Stayner where it officially loses its name. The elevated trackway of the UP Express along Goreway Dr.
Goreway Drive is named after the former Toronto Gore Township. It begins south of Derry Rd. at Highway 427 (but has no interchange), and passes under the freeway into Toronto as Disco Road. The elevated tracks of the Union Pearson Express (UP) run alongside the street near its southern end. Finch Avenue is designated Peel Regional Road 2, and runs for only 1 km. (0.6 mi.) through the extreme northeast corner of the city before continuing into Brampton where it ends at Steeles Avenue after a similarly short distance, making it the shortest regional road in Peel Region. However, to the south, it curves eastwards to cross Highway 427 into Toronto, where it continues as one of that city's major east-west streets and eventually reaches Pickering. The Indian Line Campground, situated in the Claireville Conservation Area, is located on the street. Argentia Road is located in Meadowvale, running east and southeast from Ninth Line and ending at Creditview Road, crossing Derry Rd. just west of where Derry passes under Highway 401. The section between Ninth and Tenth Lines is an extension opened in 2016. Most of the street has four lanes, except for the westernmost section, which has two lanes plus bike lanes. Credit River - Kennedy Rd. Bristol Road begins at the Credit River as a continuation of Main Street in Streetsville and continues east to Kennedy Rd. The westernmost section was an historic minor route running east from the former village. The rest of the street was built, beginning in the vicinity of Hurontario St. in the late 1980s, and reached its full length by the late 1990s. The Collegeway begins in the campus grounds of Erindale College (a satellite campus of the University of Toronto), hence its name, and wends its way west through Erin Mills to Laird Road ending just before Highway 403. It runs between Dundas St. and Burnhamthorpe Rd. and intersects with major arterial roads such as Mississauga Rd, Erin Mills Pkwy, and Winston Churchill Blvd. The road traverses mainly residential area, but does pass notable non-residential zones like Erindale College, the South Common Centre shopping mall and industrial area west of Ridgeway Drive towards Laird Rd. Tenth Line West runs north from Eglinton Ave. through Churchill Meadows and Meadowvale and ends at a dead end at Highway 401. Like Ninth Line, it was once entirely in Halton Region (and was thus originally Tenth Line East), but has been wholly within Mississauga after the 1974 annexation of lands west of Winston Churchill Blvd. It thus bears a "West" designation, though it is actually the seventh concession road west of Hurontario St. following Mississauga's survey grid. An unusual planning aspect along the street is the presence of a series of unnamed cul-de-sacs, each contained six homes, running off the west side of the street north of Britannia Road, in the Trelawny neighbourhood. Eglinton Ave. - Britannia Rd. Terry Fox Way (along with Silken Laumann Way) was formerly the part of Second Line West from Eglinton Ave. to north of Britannia Rd., after Second Line was broken up into segments after the construction of the northern section of Mavis Rd. Two other sections of Second Line south of Highway 401 are incorporated into portions of minor side streets. Second Line still exists in name north of the 401, and until 2016, crossed the freeway until the overpass was demolished for a highway widening project. A pedestrian bridge is currently under construction to replace the original structure.. The street is named after the late Terry Fox, the amputee who (with a prosthetic leg) attempted to run across Canada to raise money for cancer research, but was forced to abandon the run halfway through after his cancer returned. Highway 407 is the only privately owned highway in Mississauga and not maintained by the MTO. Highway 409 is partially located in Mississauga (namely west of Highway 427) and is maintained by the Greater Toronto Airport Authority since 2000. Sections east of Highway 427 are in Toronto and still maintained by the MTO. ^ Google (June 9, 2017). "Matheson Blvd route Toronto" (Map). Google Maps. Google. Retrieved June 9, 2017. ^ "Home – Welcome to the City of Mississauga". Mississauga.ca. 2010-07-27. ^ Scheinman, André (2006). "FARMSTEADS OF FORMER CHINGUACOUSY TOWNSHIP" (PDF). Retrieved 2018-02-23. ^ "Hurontario Light Rail Transit (LRT)". Metrolinx. Retrieved June 6, 2017. ^ "New Peel road signs pay tribute to Canada's Armed Forces veterans". Brampton Guardian. May 10, 2016. ^ Google (June 6, 2017). "Finch Avenue route Mississauga" (Map). Google Maps. Google. Retrieved June 6, 2017. ^ Google (October 26, 2018). "Argentia Road terminus in 2009" (Map). Google Maps. Google. Retrieved October 26, 2018. ^ Google (October 26, 2018). "Argentia Road looking west along extension in 2017" (Map). Google Maps. Google. Retrieved October 26, 2018. ^ "Northern Toronto Township map". The Canadian County Atlas Digital Project. McGill University. ^ "Second Line West Structure". City of Mississauga. Retrieved December 12, 2018. This page was last edited on 20 March 2019, at 03:03 (UTC).